Chichen Itza is the best preserved of the many Mayan ruins in Mexico and Central America. This structure (see photo above) is by far the tourism star of Chicken Itza. 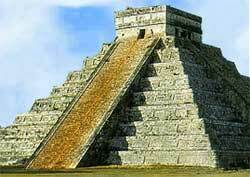 This high pyramid temple dominates the entire site and has become the visual symbol of Chichen Itza. The name El Castillo (the castle) was bestowed by the 16th century Spanish conquistadores. The ancient name is Kukulcan. Without using their hands or feet, players had to fling a ball through one of the stone rings attached high on the wall. Pictorial evidence suggests that the team captain was sometimes beheaded, but doesn't indicate whether he led the winning or losing team. An astronomical observatory with a circular tower. Its functions included identifying the precise time of the equinoxes for religious and agricultural purposes. I will also remember waking up early one morning and seeing El Caracol dramatically framed by my hotel-room window. Other worthy Chichen Itza must-sees include the Nunnery, High Priest's Tomb, and Temple of the Jaguars.